International payment operators Visa and MasterCard have started processing domestic payments inside Russia’s new national processing system, launched in response to U.S. sanctions against Moscow that saw cards from several Russian banks blocked in 2014. Observers see the creation of the National Card Payment System as the first step towards an autonomous financial system in Russia. Visa and MasterCard have begun processing payments inside Russia’s domestic system. The international payment systems joined Russia’s newly-created National Card Payment System on April 1 in what can be considered the first step towards the creation of an autonomous financial system in Russia. "The national system has already been introduced, quickly and at a little cost, and it has fully resolved the problem of payments inside the country," says Sergei Khestanov, professor of finance and banking at the Russian Presidential Academy of National Economy and Public Administration. If Visa and Mastercard do not fulfill the requirements of the Central Bank, they will have to pay a security deposit, whose size will be linked directly to the turnover of the credit card systems. 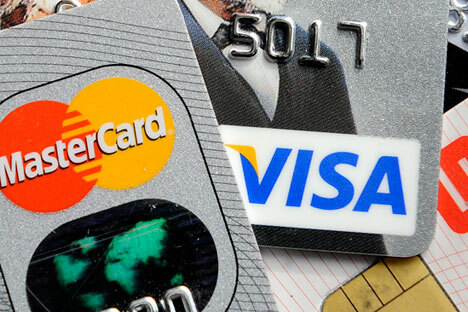 Morgan Stanley estimated the figure at $950 million for Visa and $500 million for MasterCard. The Russian government has decided to move all settlements under domestic control after the international payment systems blocked the cards of several banks in March 2014 following the imposition of sanctions on Russia by the U.S. in response to Moscow’s takeover of Crimea. According to Khestanov, processing Visa transactions through the national system should be viewed as a compromise: The Russian government's control of the transactions will strengthen, but the international systems will continue to operate in Russia. "The potential of the development of the Russian cashless payment market is still enormous," explains Anton Soroko, an analyst at Finam Investment Holding. Visa signed the agreement with the new system only on Feb. 19, 2015, while MasterCard has been on board since Jan. 12, 2015. For the time being, experts are avoiding any clear-cut predictions of success, and say that Visa's protocols are more complex than MasterCard's. "We will see if this will be successful only after the infrastructure assumes the full burden," says chief analyst at UFS IS Ilya Balakirev. The next stage should be the Russian national payment system's issuance of plastic cards, which is slated for December 2015. The picture is further complicated by the emergence of Asian operators as an alternative to western payment systems. Immediately after the introduction of sanctions against Russia by the U.S., the Chinese bank card system UnionPay entered the Russian market in April 2014, followed in March 2015 by Japan Credit Bureau (JCB). By 2017 Russia is planning to issue about two million UnionPay cards and three million JCB cards. Large Russian banks have warned their clients of possible interruptions in the servicing of payment cards. In particular, on March 30 the largest issuer of banking cards in Russia, state-owned Sberbank (102 million cards issued), started transferring internal Russian MasterCard transactions to the national system. Meanwhile, Interfax cites Director of Banking Card Management and Cash Settlement Services at Sberbank Rostislav Yanykin as saying that the transfer of Visa card transactions will take up to two weeks. The traditionally conservative Raiffeisenbank was more pessimistic. "The success of carrying out transactions in the given situation depends on several participants of the settlements, including the National Card Payment System, which is why it may take a while to solve the problem," said the Raiffeisenbank press office. Small banks were the first to adopt the new system, with the St. Petersburg-based Bank BFA announcing its full transference to the National Card Payment System on March 27. "For the clients making transactions with cards will be as before," said a spokesperson for BFA Bank. On March 25 the Tatfondbank in Kazan (800 kilometers east of Moscow) announced its successful testing of card transactions according to the national system.